No longer are the professional trades driven by the methods and process which dictated previous success. Now speed and accessibility of information are just as valuable as the quality of service. With accessibility of services and response time being the major factors driving sales, especially in the service sectors, many business are increasingly relying on Millennials to define best practices in service management technology and customer experience. The maturation and integration of the Millennial generation into the workforce has seen massive changes in how businesses operate. From the financial sectors’ significant shift and reliance on digital assets management to professional sports franchises utilisation of real time data and statistics to influence player conditioning, the millennial generation are adapting the traditional approaches and drivers of engagement to the new technological realities of the 21st century. From the incorporation of tech savvy thinking and accessibility of on-demand information in real time many industries are improving customer satisfaction, response time and the ability to manage large fleets with ease in no small part because of the internal influence of millennials in the corporate management structure. By 2025, Millennials Will Comprise Three-Quarters of the Global Workforce. What is a Millennial? What defines this generation? The Pew Research Center defines Millennials as the people who were born between 1981 and 1996. Gallup uses roughly the same time window, and estimates that there are approximately 73 million Millennials in America. At companies where managers show sincere interest in Millennials as people, the organization sees an 8x improvement in agility, and a 7x increase in innovation! Millennials are the first-generation who can objectively be viewed as digital. “Technology – particularly gadgets like smartphones, but also tablets and laptops – have revolutionised the way they connect and interact with one another and the rest of the world. How will Millennials impact how business will operate in the future? 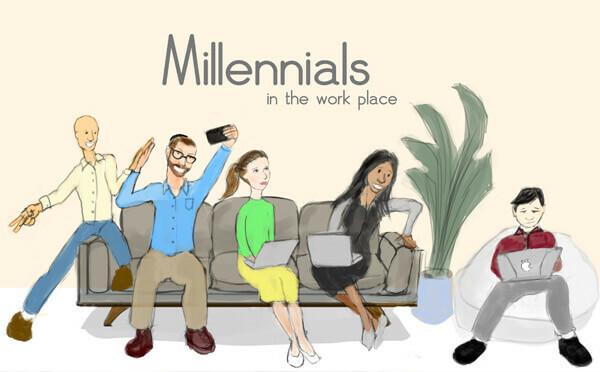 Companies and senior management teams that are most aligned with millennials in terms of purpose, culture and professional development are likely to attract and retain the best millennial talent and, in turn, potentially achieve better financial performance. Loyalty must be earned, and the vast majority of millennials are prepared to move, and move quickly, for a better workplace experience. The top priorities when looking for a job are money (92 percent), security (87 percent), holidays/time off (86 percent), great people (80 percent), and flexible working (79 percent). 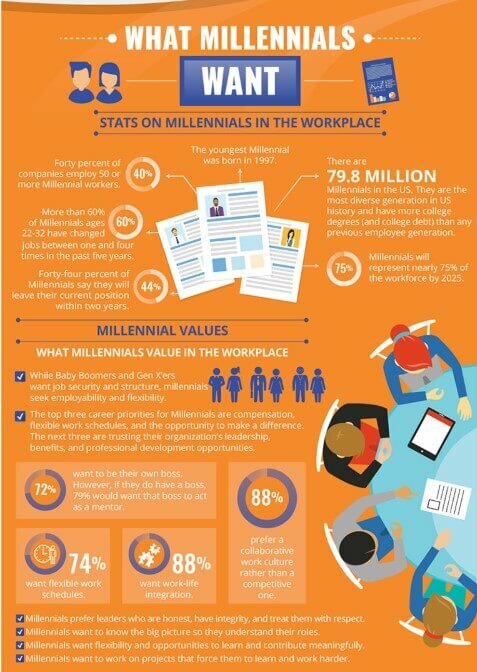 Millennials want leaders to more aggressively commit to making a tangible impact on the world while also preparing their organisations and employees for the changes in the formulative process of how Industry works. Millennials are especially motivated by dynamic, cross-functional positions that expand their skills and challenge them. As a direct result of this thirst for knowledge, millennials seek jobs that allow them to be in contact with and learn from experts with interesting and diverse skill sets. Millennials strive to enhance interactions with other professionals and teams across a number of projects and campaigns. With a clearer understanding of the factors which enhance millennial loyalty, companies can develop career paths that provide a wide range of experiences and not just vertical promotions up the totem pole. How Can BigChange help your business integrate millennials into your operations? BigChange provides a dynamic mobile workforce management platform that delivers the digital, paperless and on-demand app-based experience that today’s workforce is increasingly used to. Millenials increasingly use mobile apps and social media as their primary means of communication, whether it’s managing their lives via WhatApp and Facebook, carefully curating their online personas on Instagram or ordering food-on-demand from the proliferation of on-demand apps. Millenials increasingly demand complete integration and a seamless experience from technology; they don’t expect the need to switch between multiple pieces of software. With its easy to use interface, BigChange combines everything a mobile-workforce needs into one easy to use package. bringing together back-office CRM, intelligent job scheduling, a paperless mobile app that manages each job step by step and sophisticated live tracking of vehicles. This cloud based system can be accessed by mobile teams collaborating across multiple sites and geographies. BigChange gives millennial employees the mobile-first experience that they expect in the workplace, boosting productivity. Where previous service management methods catered to older generations with bulky paper trails and disorganised invoices, the BigChange platform, with its sleek user interface and easy to use portal gives the millennial population a vital tool to manage the customer experience and support technical staff while allowing the back office to manage all billing and invoices in real time. BigChange gives Power to the Paperless! Previous PostLeader for Life monthly Best Driver Winner, tells us why driver safety and accountability is essentialNext PostCEO’s Blog – When was the last time you visited your shop floor?